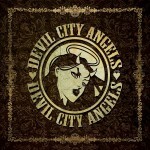 Share the post "Album review: DEVIL CITY ANGELS"
You may hear that Devil City Angels comprises of members of L.A Guns, Cinderella and Poison and think ”oh great, yet another super group”, and yet this time the band really may be on to something. Devil City Angels comprises of Poison drummer Rikki Rockett, L.A Guns’ Tracii Guns on guitar, the relatively unknown vocals of Cheap Thrills’ Brandon Gibbs and Rudy Sarzo (Quiet Riot, Ozzy Osbourne, Whitesnake, Dio etc) taking over bass duties from Cinderella’s Eric Brittingham – and it is the vocals that make this band impossible to compare to any of those mentioned above. The album has a big 70’s/80’s feel, as you would imagine, which combines big groove driven and bluesy rock with those great backing vocals and little musical touches that you would expect. There are elements of Led Zep here and there, a touch of Mr Big in places and “All My People” has a nice Aerosmith vibe to it. “No Angels” is a song that Bon Jovi would kill for right now, “Ride With Me” would make a great single in the US, while “I’m Living” is a great radio friendly number that you could well imagine Poison playing live. The album is full of well written, easy to listen to songs such as the ballad like “Gone Forever”, the pop friendly “All I Need” or the Sammy Hagar meets Led Zep feel of opening track “Numb”. However, for me, the real winners here are the likes of “Back To The Drive” with its 70’s glam rock drums, big vocals and great guitars, “Boneyard” and “Bad Decisions”. Devil City Angels would no doubt make a great live entity and a second album could only build upon the great work here. However, the band may have already moved on as Guns and Sarzo are touring with the heavier Gunzo, whilst Gibbs and Rockett have formed The Special Guests with fellow Poison members C.C Deville and Bobby Dall – and in the absence of Poison front man Bret Michaels are touring the band’s live show. This entry was posted in ALBUM REVIEWS, ALBUM REVIEWS (Mobile), All Posts and tagged album, classic, Devil City Angels, LA Guns, melodic, Poison, review, Rikki Rockett, rock, Rudy Sarzo, Tracii Guns, Whitesnake. Bookmark the permalink.